Happy New Year! I know, I know, it’s Jan. 13 and I’m posting my first recipe of the year 13 days in because on New Year’s Eve I came down with the World’s Worst Cold. Then – surprise – my husband caught it. Sometime last week, while on a Theraflu/Tylenol high, I offered to cook dinner when my father-in-law came to visit us last weekend. Thank goodness for the NFL playoffs! Playoffs are the perfect excuse to make laid back finger foods – like I am doing everyone a huge favor by thoughtfully and selflessly preparing the easiest foods I can think of! Did you know that I worked at a family-owned pizza shop for eight years? Pizza still is one of my very favorite foods, but I am very, very choosy about what constitutes good pizza. Here is my easy, but delicious, method of the perfect party pizza. Keep on reading below the recipe – I’ve put together some quirky and creative pizza ideas for your parties this year. They are perfect to serve at your academy awards party, your book club meeting, your Valentine’s Day dinner (think heart-shaped pies), your girls’ night in or your ladies poker night. And, in case you’re wondering, YES. Yes, I can toss my pizza dough into the air and catch it. Pizza Dough: I used Safeway pizza dough and I thought it was great. Trader Joe’s also makes a good one. You also can usually buy fresh pizza dough from your local pizza shop for a couple of dollars. 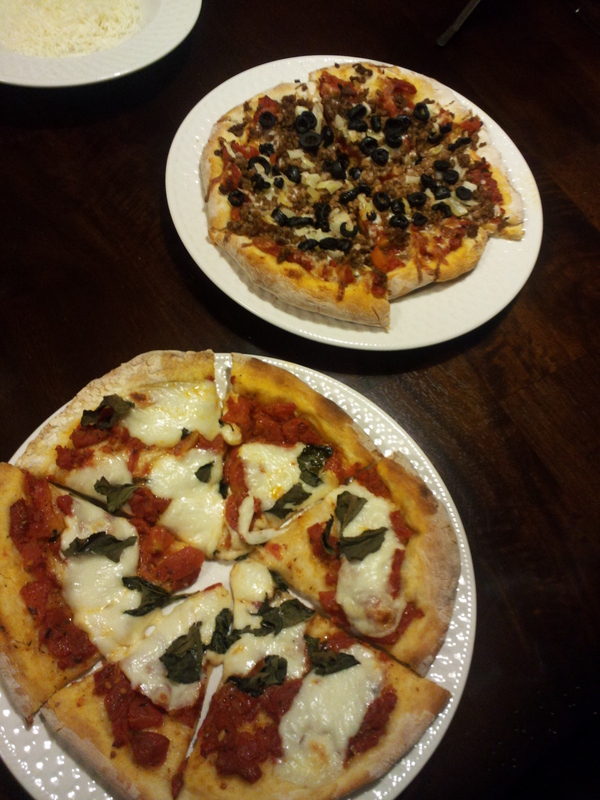 For the pizzas pictured above, I used half of a pizza dough for each one. This works well if you want to make a variety of pizzas for your guests to sample. For a family dinner, you can make one large pie. Pizza dough tips: Keep your dough cold in the refrigerator. Take it out a few minutes before you’re ready to use it, but don’t let it warm to room temperature. It becomes gooey and thin and difficult to work with. You want a cool workable, dough. Heat oil and brown garlic. Add tomatoes, oregano, basil, salt, pepper and sugar. Add more sugar for a sweeter sauce. Cook over medium heat for 15 minutes until sauce thickens. Pizza Sauce Tips: I doubled this recipe to make the four smaller pizzas. I had just enough sauce for all four. If you like a saucier pizza, I suggest either making more of this recipe or buying grocery store pizza sauce (this is different than spaghetti sauce), which is a thicker saucier consistency, rather than the chunkier consistency of my homemade sauce. You can make your sauce ahead of time since it will heat up when you cook your pizzas. This can be a time saver that allows you to spend more time with your guests! Start with a cold pizza stone in a cold oven. Preheat your oven with the stone in it to 500 degrees (your stone could crack if you place it into a hot oven). Prepare a lightly floured work surface. A baking mat or parchment paper held down with scotch tape works well. To make smaller pizzas, cut the dough in half, using one cut through the middle. Cover your entire pizza dough lightly with flour. Take one half of the dough and using the pads of all of your fingers, press down and outwards in even strokes. This will start flattening and spreading your pizza crust. Do this evenly over the whole surface – this will help prevent air bubbles from rising up and pushing away your sauce and cheese while it cooks. Try to maintain and form a round shape while you’re doing this step. Do not fold or cut dough into pieces to attempt shaping. This will make your dough uneven and will cause tears in the dough when you are ready to stretch it. Next, pick up the dough and without stopping, run your pointer finger and thumb around the edge of it and pinch down lightly, while rotating it through those fingers with your other hand. This forms the pizza’s crust. Your fingers should slide easily over the dough since it is covered in flour. Make sure you’re sliding the dough, not pulling it. Next, make two fists (you may want to throw a bit of flour on top of your knuckles). Sit the dough on top of your left fist, while using your right fist to rotate the dough in a circle and lightly stretching it outwards. This will expand your dough to its actual pizza pie size. Make sure to keep the dough rotating at all times. Remember to use fluid stretch/rotate motions and don’t pull or tug. Letting the dough sit on your fist will cause it to fall through and you’ll have a huge hole in it. Using fluid motions will result in evenly stretched dough. At this point, you may have some thin spots or even some tears in your dough. It should be ok. Don’t re-roll your dough and start over. Put your dough down on your lightly floured pizza peel. If you have any tears, you can stretch one side of the tear over to cover the hole. Press down to adhere. You may also use a bit of water to make the dough stick together. Don’t leave any tears in your dough. While cooking, the sauce will bleed through and your pizza will stick to the pizza stone and rip when you try to remove it. Cheat alert: In lieu of the stretch/rotate step above, you can use a lightly floured rolling pin to flatten your dough. This might be safer for a beginner, but there will be a difference in the texture and consistency of this pizza crust versus the hand-tossed pizza crust. Use a ladle to spread sauce on your dough in a circular motion, working from the center, out to the start of the crust (this is the seam that you created when you pinched around the edge of the dough earlier). Sprinkle shredded mozzarella cheese over the sauce. For a margherita pizza, use slices of fresh mozzarella. Add any toppings on top of the cheese. At this point, you can slightly adjust the shape of your pizza. It will stay better with all of the toppings on it. To make a heart-shaped pizza, use your finger to make a dip in the top center. Then, lightly push in the sides to make the bottom point of the heart. Pick up your pizza peel and tilt the handle upwards and shimmy it lightly to transfer the pizza onto your pizza stone in the oven. Cook until the cheese is melted and your crust is cooked to your desired crispiness. To remove your pizza from the oven, position your pizza peel at the bottom of it and use two fingers to pull the pizza by the crust onto the peel. Do this quickly and use your fingertips so you don’t burn yourself. Transfer your pizza onto a pizza tray or a cutting board and slice immediately. Remember to lightly flour all surfaces again when you make each pizza. Don’t use too much, though, or you’ll have a layer of flour on the bottom of your pies. Making the perfect pizza takes practice! Working with the dough is an art and getting your sauce right, the perfect amount of cheese and cooking it to the perfect amount of crispiness all take practice. Don’t get discouraged and have fun! As promised here is a list of some quirkier pizzas you can try. Buffalo chicken pizza: pizza sauce, mozzarella cheese and cut-up chicken tenders soaked in hot wing sauce. Try dipping your slice in bleu cheese dressing as you eat it!